Cartier has just taken the covers off the Rotonde de Cartier Astromysterieux, the flagship complication of its offerings at SIHH 2016. Constructed in an ingenious manner, the entire Astromysterieux movement – which the first of its kind, a central, mystery, flying tourbillon – floats in the centre of the case, seemingly unconnected to the dial around it. Though it tells only the time, the Astromysterieux is powered by an exceptionally complex movement, most of which is elegantly hidden. To understand this watch, a brief history lesson is necessary, explaining the two intertwining strands that produced the Astromysterieux. The first is well known: Cartier has a long history with the mystery timepiece, dating back to the 1920s when clockmaker Maurice Couët developed the first mystery clocks for the jeweller. These were lavish and elaborate constructions, made of precious metals, gemstones and other pricey materials. They were offered in a diverse array of styles, but all shared the same mystery time display – featuring hands that seemed to float in midair. The intriguing time display was actually invented earlier, by Jean Eugène Robert-Houdin, a clockmaker turned magician who later inspired Harry Houdini (who in turn named himself after Houdin). 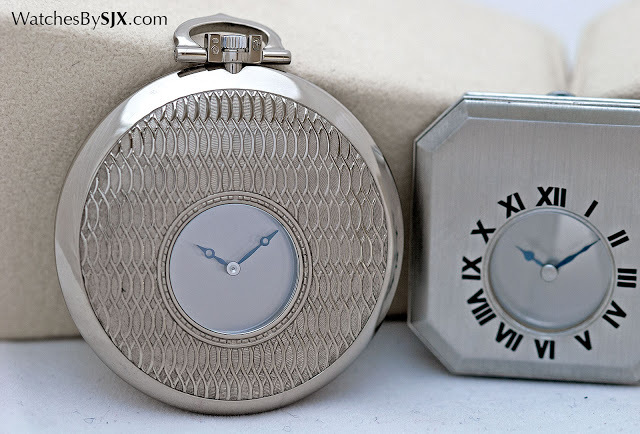 But it was Cartier that made the mystery clock its own, eventually developing mystery wristwatches, like the recent Clé de Cartier Mysterious Hour. 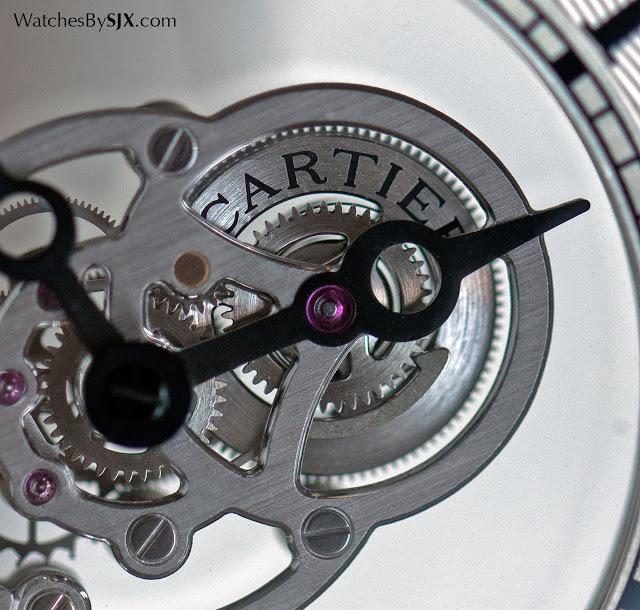 The other strand of history involves Carole Forestier, the head of movement development at Cartier. In 1998, Forestier won the Prix de la Fondation Abraham-Louis Breguet, an award given by the Breguet foundation to mark the 250th year of the Breguet’s birth. 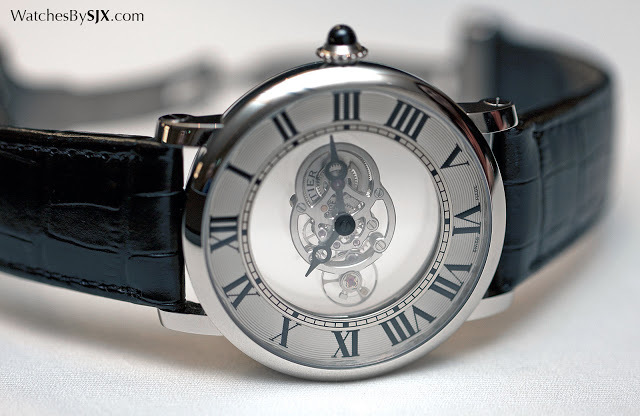 Not yet 30 years old, Forestier was then a watchmaker at Ulysse-Nardin. Her winning entry was an innovative carrousel central, in which the entire movement sat on a platform that rotated around the dial. Ulysse-Nardin was so impressed by her idea it purchased the concept, which was subsequently refined by Ludwig Oeschlin, and introduced as the Freak in 2001. Forestier’s latest creation is in essence the culmination of the 18-year quest to create the award-winning carrousel central. True to Forestier’s original idea, most of the 9462 MC movement is suspended in the centre of the dial. 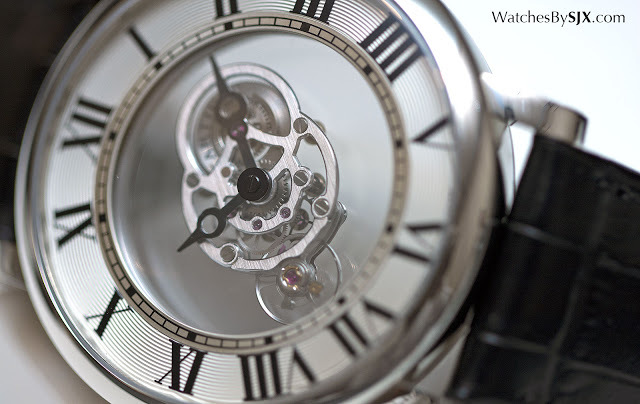 Despite its simple appearance, it only has two hands after all, the movement is made up of 408 parts (of which 188 are ball bearings), four times the number of components for a conventional, time-only movement. 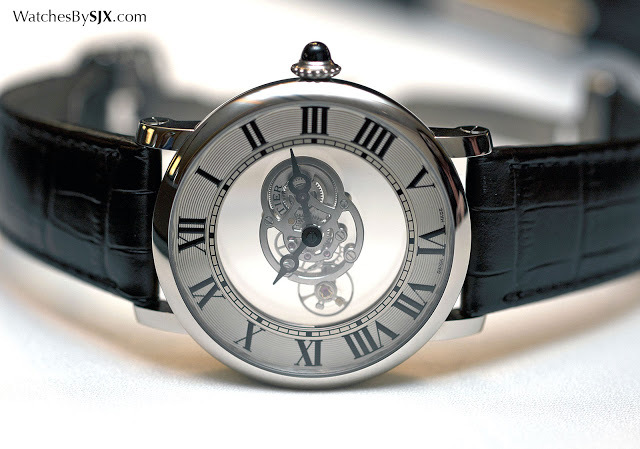 Put simply, the Astromysterieux is a modest watch – highly complicated, but with most of its finesse hidden. Think of it as the tourbillon reinvented: nearly all its moving parts, barrel, gear train and regulator, are contained inside a carriage that makes one revolution very hour. 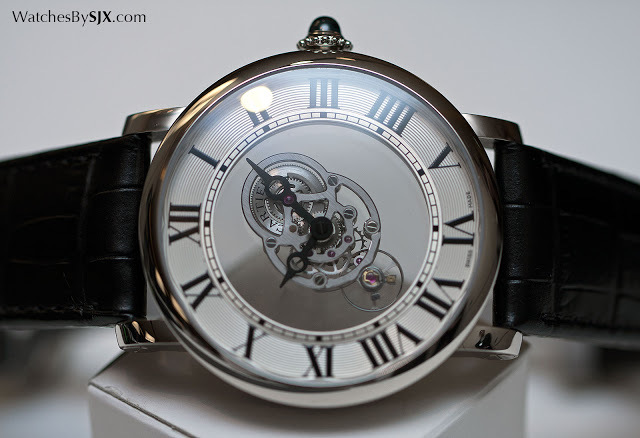 Made up of a visible upper bridge and a transparent sapphire disc below, the cage floats in midair, surrounded by the guilloche chapter ring with the hour numerals. 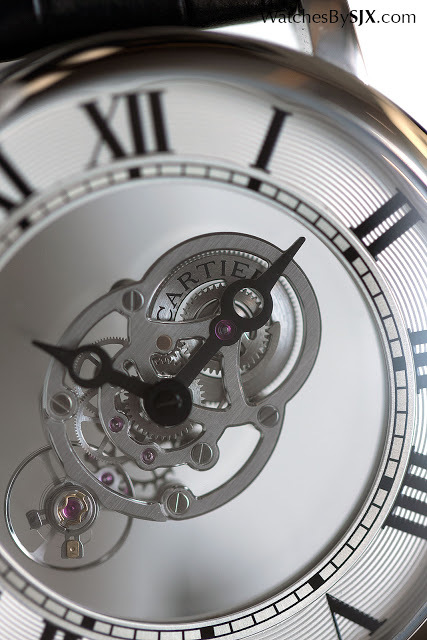 At one end of the cage is the barrel, topped with “Cartier”, and at the opposite end is the balance wheel. In-between the two lies the gear train. This entire mechanism, including the regulator, makes one rotation around the dial every 60 minutes, making it a 60-minute central tourbillon. And for that reason the minute hand is mounted on the bridge. 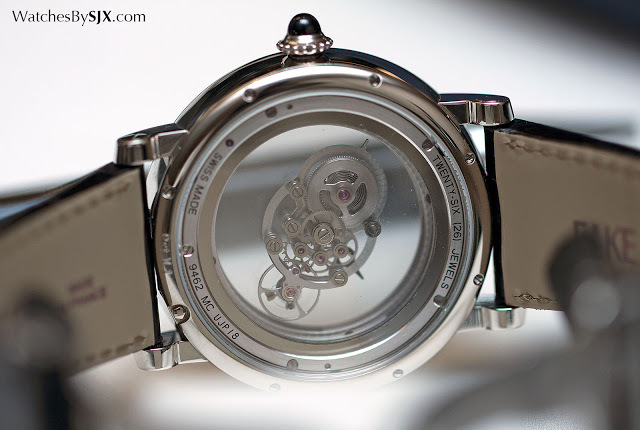 Despite the unorthodox construction, the calibre 9462 MC is a tourbillon. In Abraham-Louis Breguet’s patent for the tourbillon, he specified a fixed wheel for the carriage, so stopping the carriage stops the movement. Likewise, if the carriage of the Astromysterieux is stopped, the movement halts. The tourbillon cage, essentially the bridge and sapphire disc, weighs just 3.75 g. To balance the weight of the moving parts, an 18k gold weight is affixed to the end of the sapphire disc. 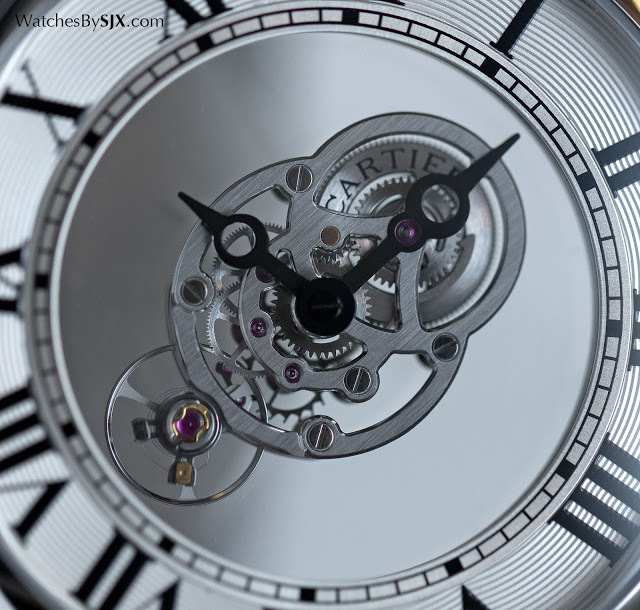 The secret to the floating movement are four clear sapphire discs, each superimposed on top of the other. The topmost carries the movement parts, while the second holds the hour hand. 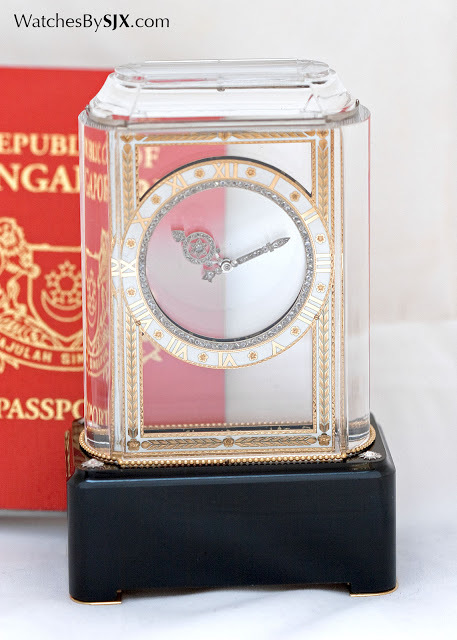 Another is the winding mechanism, being linked to the keyless works of the crown. And the final piece is a fixed sapphire disc that acts as the base plate. 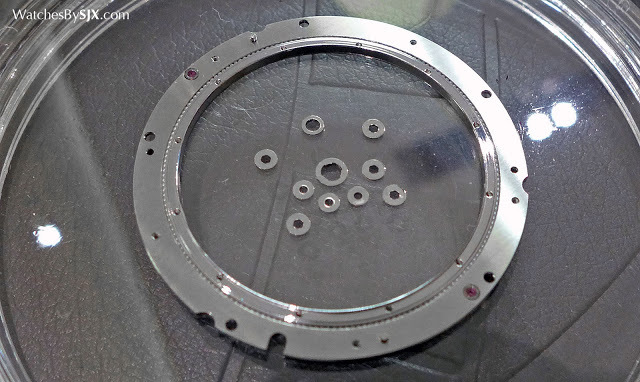 All the discs have metal teeth on their rim, made via deep reactive-ion etching (DRIE), a high precision used to make memory and also watch components. 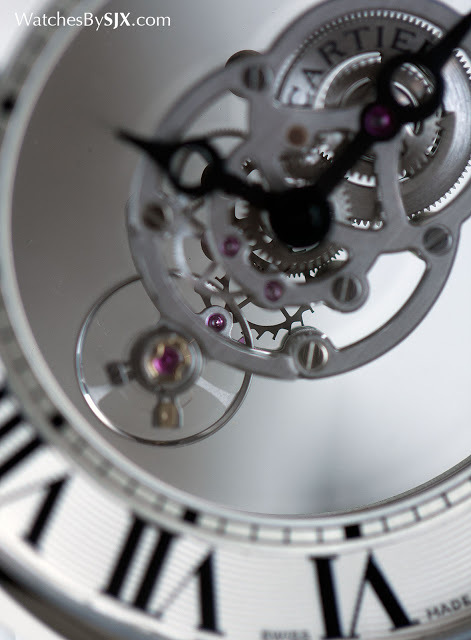 All the teeth, as well as the gearing for winding and setting, are hidden beneath the chapter ring of the dial. Most of the teeth are extremely small, the hour sapphire disc, for instance, has 360 teeth on its rim. Even securing the discs to the plate is a complex task. The discs are mounted on shock absorbing springs, while the hour disc is mounted on four runners, two of which are eccentric. Essentially screws to position the disc, the eccentric runners can be tweaked to align the disc dead centre as well as perfectly flat. The Astromysterieux is a limited edition of 100 piece in palladium with an estimated price of €145,000. Additionally, there will be a 30-piece limited edition with a baguette diamond set bezel, priced at €220,000. Another 20 pieces will be made with a diamond bezel and dial, with a price tag of €280,000. And the most elaborate is the 5-piece edition, with a matching diamond set bracelet (totalling 35 carats) and a price tag of €1 million.